My son and a friend of his belong to the local game shooters' club and last year I was presented with two turkeys and two geese which I brined before roasting and all were delicious - far better than any other game fowl I have ever eaten - not tough, not dry, not really even gamey (a good thing IMO). BUT: Now I can't find the recipe I used. In a week my son's friend is having his twenty first and all the guests have been asked to bring a hand written recipe for game - I was going to give him the brining method and recipe, the one I can't find. I can find several online but none seem quite like the one I used. Would any of you, by any chance, have an old traditional recipe? (or a modern one) that is tried and true please? I would be very grateful and will post a .pdf of the finished calligraphy for you all to use. That's a rough one, as we don't know the sort of thing you did with the birds, other than brining (which, btw, is not a traditional method). If you could give us some idea of the flavor lines, method of cooking, etc. it would limit the field a bit. Breast out one or two geese, leaving skin attached. Sprinkle with salt & pepper and brush with softened butter. 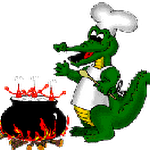 Cook, under a broiler or over hot coals, until just cooked through. You want it rare to medium rare, otherwise it gets tough. Serve sliced thin with Cumberland Sauce. Remove the rind of the orange and lemon with a vegetable peeler. Chop the skins finely and boil five minutes. Drain and set aside. Boil shallots in water to cover for one minute. Drain and set aside. Squeeze the orange and one third of the lemon. Put juice in a saucepan with the jelly, Port, ginger, cayenne, and mustard. Heat until the jelly melts. Add the rinds and shallots. Serve hot or cold with any game meat or birds. You can either stuff the bird or cook this on the side. Preheat oven to 300F. Roast turkey for 30 minutes per pound, if stuffed. If not, cut back to 25 minutes per pound and adjust accordingly at the end. Soak prunes in water until plump. Blanche almonds by pouring boiling water over and let stand five minutes. Then pop 9out of their skins and slice in half lengthwise. Warm butter over low heat in a large pan. Saute apples until transparent and tinged with color. Add cake crumbs, almonds, prunes, sugar, salt, pepper, nutmeg and apple cider. Mix and stir. Let cool and stuff into turkey, sewing up openings. Hi Effigy...nice to see you! I don't have a brining recipe that I consistently go to, sorry. As Brook mentioned, is there any distinguishing factor that you remember about your brining recipe that may help us narrow in on recipes like it? From memory after we dressed them. I made up a bucket full of brine, it was boiled and cooled and had some spice but I don't recall what, the turkeys were totally immersed for I think 48 hours, with a bit of turning. Then I stuffed them with sage and onion stuffing made with our own sausages (the stuffing recipe is in my head) I made up a cranberry butter (Jamie Oliver recipe) and shoved that up in between the skin and the breasts (I have small hands - that part is easy) self-basting. Then I trussed up the legs and wings so it was a nice tidy solid lump and roasted for about 20 min per pound - but I have a meat probe these days so I would go for an internal temp of 150°C. After roasting I wrapped in foil and rested 30 minutes before breaking apart and slicing the breast meat. I am fine with the stuffing/roasting part, it is the actual brine I can't remember - how much salt to how much sugar to how much water - and what spices? Although I have some juniper berries in my cupboard which I don't often use - maybe I bought them for the brine? Search for 'Judybird' on the internet, you should find a recipe for dry-brining a (domestic) turkey. Dry-brining is simple and a lot less space-consuming than wet. My memory says to take an unthawed bird, rub it with 1T. kosher salt per 5lb. (and whatever spices your little heart desires), place in a large plastic bag, seal and refrigerate until thawed, turning once daily. Moisture will be drawn out by the salt as the bird thaws and then reabsorbed along with the salt and flavors making for one really tasty bird. I refuse to fix turkey any other way. I usually cook on a covered grill with a little cherry wood thrown on the coals for a light smoked flavor. Thanks Tom, I will give that a go for myself - I have a domestic turkey in the freezer. But, for the purposes of the twenty-first gift page I would like to give him a recipe that I have trialled out and which I know from experience will work. 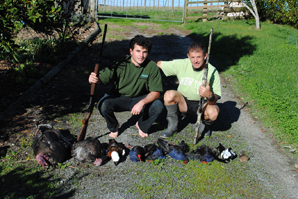 I expect it is as much about the method as the actual flavours, I am sure we have all had tough dry game bird meat at one time or another, I want to give the lad a method to prevent that. Here's my recipe for brining Ann....very basic, but add what you'd like. This is a very versatile brine for pork and poultry. Mix all ingredients in a large bowl, whisking furiously until salt and sugar are dissolved. Place meat in a ziplock bag and pour brine over until completely submerged. BAY LEAVES! Yes that was it! I have a bay tree and I put a small branch in the cavity before submerging the bird. I remember now. It was a large gobbler and he was in the bucket for nearly 2 days, I had to empty the beer fridge to fit him in. Glad to help Ann...good luck with it.